For context on the NUS, our explainer may be found here. Two student association Presidents have said they do not support the set of KPIs to be brought before the NUS (National Union of Students) for conditional affiliation, which ANUSA agreed to last Tuesday. Other presidents claim a letter to the NUS attached to ANUSA’s SRC 2 agenda was just a draft, and that names would be removed or left in based upon whether they passed at the respective student councils. The letter listed a number of transparency and accountability KPIs (key performance indicators) for the NUS to meet in order for the eight student organisations to accredit for 2018. 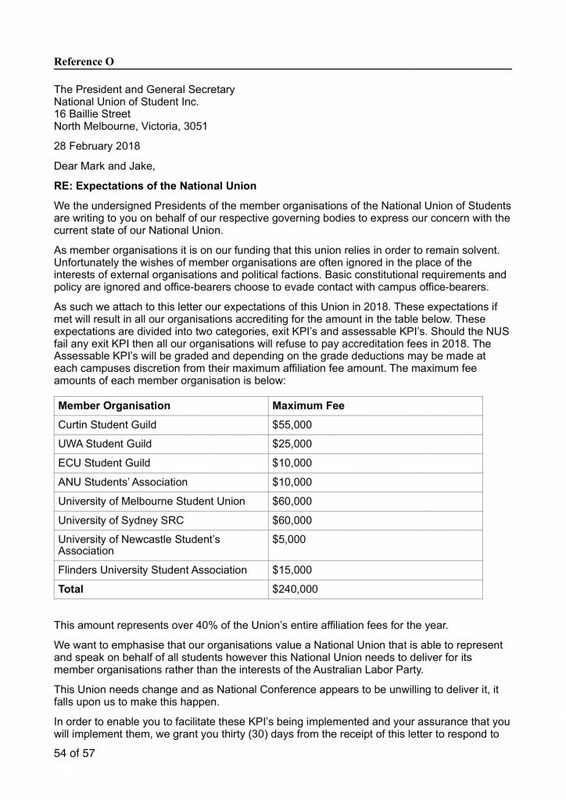 The names of Presidents of eight student organisations were listed at the bottom of the letter; hailing from ANU, Curtin University, the University of Western Australia (UWA), Flinders University, Edith Cowan University (ECU), the University of Sydney, Newcastle University, and the University of Melbourne. Of these, Observer can confirm that student associations at ANU, Curtin, Newcastle, ECU and UWA have passed motions endorsing the KPIs from the letter. Cai told Observer, “Imogen and I are in a similar boat with this letter so I would not dispute her statement at all.” The Flinders University Student Association (FUSA) President likewise stated that the FUSA Student Council had “not yet come to a collective, formal decision on whether or not we will sign the letter in question”. FUSA will next meet in early April. 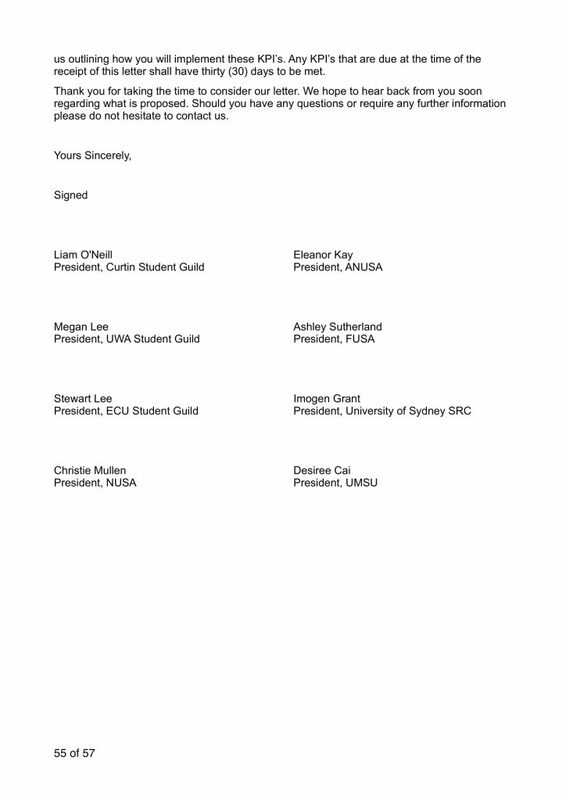 The University of Western Australia (UWA) Student Guild President Megan Lee, Curtin University Guild President Liam O’Neill, and Edith Cowan University Student Guild President Stewart Lee stated that they had played a role in writing the letter, but added that no one would officially sign the letter until the KPIs had been put to the councils of all the universities. Newcastle University Student Union (NUSA) President Christy Mullen, on the other hand, confirmed that they were a signatory to the letter. O’Neill said that the letter was written following conversations between National Independents, while Stewart Lee stated that all the potential signatories were “quite close” and that planning had started at the NUS President’s Conference in January. Lee further said that the names upon the letter were those who collaborated in forming the KPIs, and that having all the names there was “standard letter drafting process”. 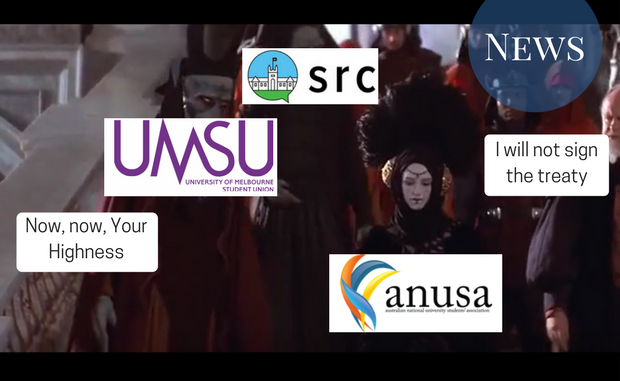 ANUSA President Eleanor Kay told OGM 1 last Thursday that “I believed I had been clear to the SRC that this was a draft [letter], I apologise if I did not”. On Tuesday the SRC voted to affiliate subject to the KPIs proposed by the coalition of universities before this controversy had come to light. After the vote, Kay said that “It has definitely passed through some SRCs already, which is why substantive changes to the KPIs were not appropriate.” General Representative Ashish Nagesh told Observer he was unhappy with the inflexibility of the KPIs. “The message was loud and clear the exit KPIs could not be amended and were clearly not drafts hence why I struggled to pass my [amendments to the] KPIs”. The letter attached to the Agenda of SRC 2, page 1. The letter attached to the Agenda of SRC 2, page 2.